The German Kfz15, built by Horch and several other manufacturers, was the prime mover for staff officers of most of the German military through WWII. It saw service with almost every branch and division and was particularly useful for high command as a staff car, as well as serving as a mobile radio unit with the signal corps. One unique feature of this type was the use of a third set of wheels mounted to the middle of each side of the vehicle. These were essentially spare tires but also aided in travel over steep hills. 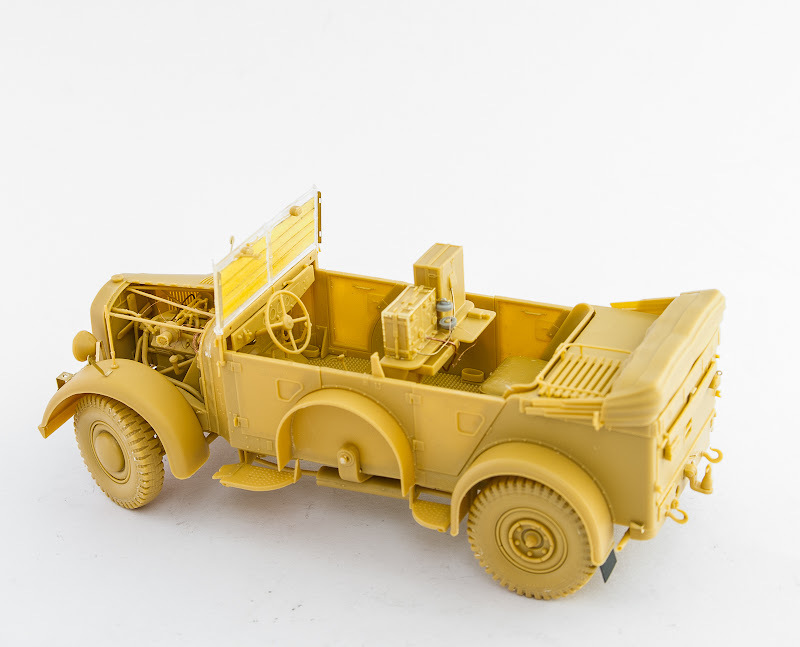 Italeri’s Kfz.15 Funkwagen kit comes packaged in a sturdy end-opening box with the typical artist rendition of the Funkwagen depicted on the front. All of the parts come supplied in one large plastic bag. There are two grey colored styrene sprues, one clear sprue, and a set of 6 vinyl tires on a separate black sprue. The clear plastic and vinyl tires are packaged individually inside their own bags; a nice feature to protect the parts. Italeri has issued versions of the Kfz15 in the past where they have been re-pop releases. While the tires, clear parts and ‘B’ sprue are the same as in the previous releases, sprue ‘A’ is a new tooling. The figures have been removed making room for the furled roof and various interior detailing such as the radio equipment. The majority of the parts for this Funkwagen are contained within the two grey colored sprues; A & B. Sprue A contains suspension, drive train, and frame parts. Details are crisply molded with no visible flash. There are some ejector pin marks that can be seen on about half of the parts, but are very shallow and should present no problems with a little attention. This sprue contains the panels for completing the construction of the body of the vehicle, the one-piece roof section and various standard interior detail parts. Sprue B features the same crisply detailed, flash free moldings. Please note, this sprue contains many small and delicate parts and will benefit from the use of a fine toothed hobby saw or a very sharp knife blade when removing the parts. Sprue C contains the clear parts used for all of the windows and two headlight lenses. Aside from several small bubbles in one of the windows, these parts keep with the previous quality of moldings provided in earlier kits. The final sprue tree is the black vinyl sprue. This contains 6 tires; four wheels and two spare tires. These tires feature an alternating tread pattern with the slightest mold seam down the middle, which should present little problems after a quick drag over sandpaper. The instruction sheet provided with this kit is a 4 page, black and white folding design configuration presented in an exploded view format with large easy to read diagrams and parts call-outs. The instructions are particularly easy to follow, although a word of caution as some parts are in-correctly marked. Contained within the instructions is a painting scheme for two vehicles, one of the 21st Panzer Division of North Africa 1942, and the other a Regimental staff car of the Hermann Goering Panzer Regiment in Italy late 1943. Lastly, there is a small decal sheet provided supporting the two color schemes provided. These decals are cleanly printed decals with virtually no carrier film beyond the details edges. Italeri’s Kfz.15 Funkwagen is an interesting subject that begs for a small diorama or vignette (the opening scene of "Battle of the Bulge" comes to mind). The layout of the kit and included instructions make for basically an easy assembly. The large printed diagrams make for easy parts identification and installation. With excellent injection molds and clean releases allow for a tight fit to the parts without a lot of filling and only slight sanding of the pesky ejector pin marks. The kit provides welcomed options including depicting the vehicle with an open cab, enclosed cab, and an open trunk area if so desired. You must review the instructions closely to make these choices on your own. The part call-outs in the instruction are occasionally wrong, so special attention must be taken to look before you cut. The body construction will benefit from dry fitting and quick drying glue. One minor let-down is there is no engine supplied with this kit leaving and empty engine compartment leaving a little scratch work and a spare engine for those who want to open the hood. Not being a WWII expert, I have enjoyed playing around with this kit so far. Up to the point of construction none of the issues mentioned herein have caused overly difficult fixes on my part, so I would say this is a simple to construct kit that builders of all experience levels will enjoy. Highs: Interesting subject, relatively easy assemble, clean molds and decent detailing. Lows: Numerous ejector pin marks, some trouble spots in the instructions to be aware of, no engine supplied for under the hood. Verdict: Basically a decent rerelease of a previous Italeri offering with some retooling to add the open top option and radio. Should be a fun kit for any modeler interested in the subject at hand. I am middle/late 40s, and have been modelling in plastics most of my life. I started around 7 years old, mostly aircraft and armor. I work full time as a Lieutenant on a career fire department. I also currently am the secretary of the organization Armor Modeling Preservation Society. Copyright ©2019 text by Brian [ FHVN4D ]. Images also by copyright holder unless otherwise noted. Opinions expressed are those of the author(s) and not necessarily those of AeroScale. All rights reserved. I don't mind this kit, the earlier version was a fun build. Italeri should have actually called the original release kfz 12, the regular staff car/ carrier version. The kfz 15 is a designation for radio and signals vehicles. It looks neat but with two Tamiya Horches, two Tamiya Steyrs, two Italeri/Bilek kfz 12s, two VWs, various kubels/schwimmwagens and two Topolinos I don't think I need anymore cars! And why the tamiya's ford don't see the light as 1/35?